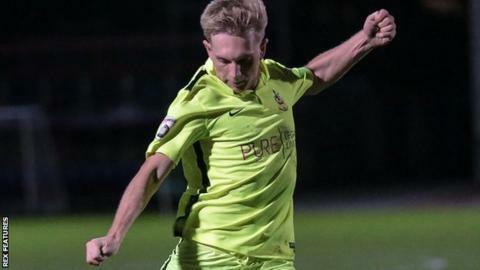 Southport claimed a sixth consecutive National League win as they came from behind to beat Wrexham. Wes York put Wrexham ahead from close range before Louis Almond's deflected shot saw the hosts level at the break. Luke Foster headed Southport in front after half-time before substitutes James Gray poked in for the visitors from a corner to make it 2-2. But Jamal Fyfield brought Almond down in the box and the striker stepped up to score from the spot to win the game. Wrexham have now lost three games in a row, a run which started with defeat at home to Southport in the reverse fixture on Boxing Day. Wrexham manager Gary Mills told BBC Radio Wales: "A couple of decisions could have changed the game but ultimately we've conceded three goals. "We're not keeping clean sheets and it's costing us. We've come away from home and scored two goals but ended up losing the game. "We cannot continue to defend and concede goals like we are doing. The two goals we conceded in the second half were very poor and cost us the game." Match ends, Southport 3, Wrexham 2. Second Half ends, Southport 3, Wrexham 2. Attempt saved. Wes York (Wrexham) left footed shot from the right side of the box is saved. Attempt missed. Adam Blakeman (Southport) left footed shot from outside the box is too high. Michael Phenix (Southport) is shown the yellow card for a bad foul. Foul by Michael Phenix (Southport). Goal! Southport 3, Wrexham 2. Louis Almond (Southport) converts the penalty with a right footed shot to the bottom left corner. Penalty conceded by Jamal Fyfield (Wrexham) after a foul in the penalty area. Penalty Southport. Louis Almond draws a foul in the penalty area. Offside, Southport. Andrew Wright tries a through ball, but Andrew Wright is caught offside. Connor Jennings (Wrexham) is shown the yellow card. Goal! Southport 2, Wrexham 2. James Gray (Wrexham) right footed shot from the centre of the box to the centre of the goal. Assisted by Dominic Vose. Substitution, Wrexham. James Gray replaces Mark Carrington. Substitution, Wrexham. Dominic Vose replaces Blaine Hudson.